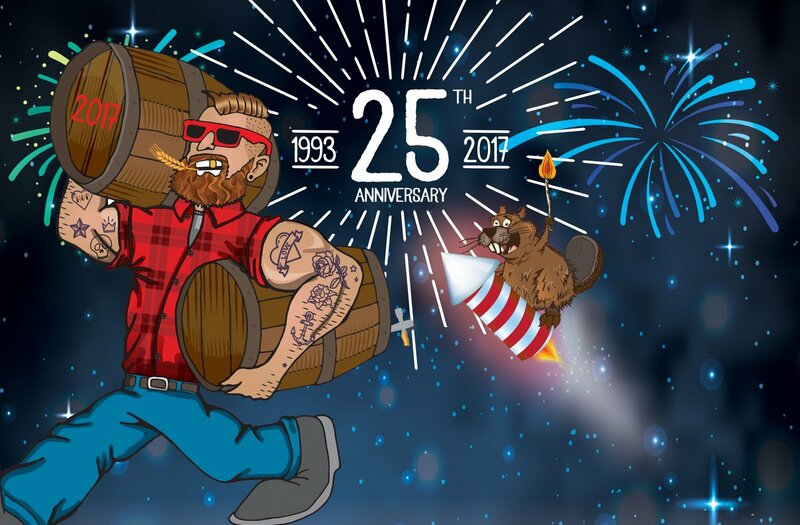 The 25th Annual Great Canadian Beer Festival will take place on Friday/Saturday, September 8th & 9th, 2017. Canada’s longest-running beer festival is fortunate to have had amazingly stable leadership over the years. Founding organizers like industry veteran Gerry Hieter, original CAMRA Victoria President John Rowling, and CAMRA BC Past President and What’s Brewing founding editor Phil Atkinson all still serve as directors of the Great Canadian Beer Festival Society, which is respected internationally. In advance of this year’s auspicious occasion, What’s Brewing made contact with the three gentlemen to pull a few stories out of their memory banks. To accompany this interview, we took the opportunity to flip through some back issues of What’s Brewing (which has been around a few years longer than GCBF) for coverage of BC’s premier beer festival, going back to before it was first held in 1993. Click to enlarge this ad placed in July 1992 What’s Brewing: Complimentary souvenir glass! Two tasters! Does the basic format seem strikingly similar to that of any given present-day BC beer festival? 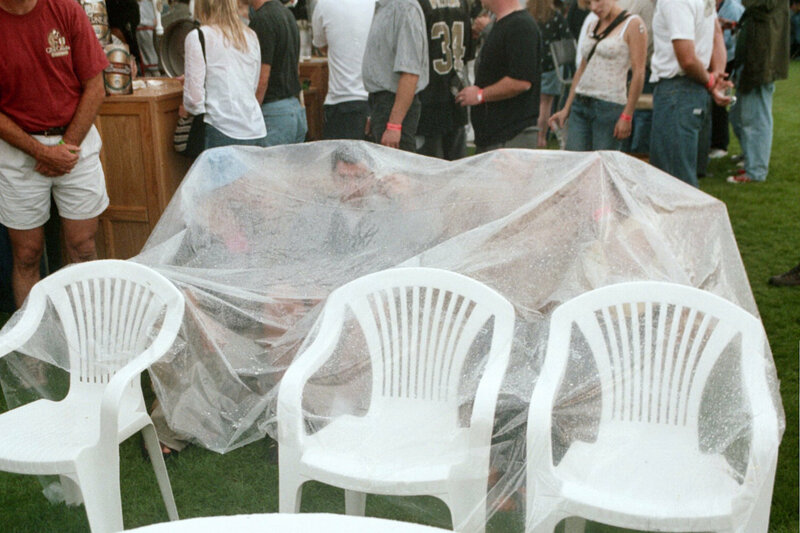 Actually, the history of beer festivals in BC predates this watershed event. There was a significant interest in “non-commercial beer” that even preceded the registration of CAMRA as we know it now, back in 1990. As documented right on the CAMRA BC website: by the mid-1980s, the consumer group CAMRA UK had propagated its message to Canada via the creation of a national organization based in Ontario, of which there were a few dozen BC chapter members in Vancouver and around BC. Early Victoria member Phil Atkinson separately helped create a Great Western Beer Festival that ran during the late 80s, featuring homebrew and beer food. He looked forward to the day there would be something better. July 12 [sic], 1992, saw the first microbrewery beer tasting in British Columbia. Held at the George Pearkes arena in Saanich, the event attracted Victoria’s beer lovers to sample an array of fresh, local beers and several Real Ales. Participating breweries were Vancouver Island, Okanagan Springs, Whistler, Shaftebury, Sunshine Coast, Horseshoe Bay, Swans and Spinnakers. The other two microbreweries, Granville Island and the Nelson Brewing Company, were unable to make it. This festival was not GCBF; it was actually a spinoff event from a Caribbean music festival called Sunfest. However, it involved the participation of a recently-incorporated beer enthusiasts’ group, CAMRA Victoria, whose founding President John Rowling—soon to co-found GCBF—learned immensely from the experience. What did you gain from that precursor event, which was presented by Van Isle Productions (VIP)? John Rowling: The original Sunfest was held at Elk Lake, North of Victoria. Irwin Rodgers (VIP) asked CAMRA to help, so I phoned all 10 BC breweries to get them to come, and several members helped organize. Only 150 tickets sold, which is what happens when you don’t advertise! Gerry Hieter: I would have to say that it showed us what not to do, which is: announce an event, and then hope someone comes out for it. I’m afraid that the majority of brewers who attended that event said they would not support another CAMRA-run festival. I conveyed this to John who knew what I was talking about and agreed. Phil Atkinson: Of course, I wasn’t referring only to the money. We learned quite a lot from that first attempt. Not long after this first event, the topic of holding another event came up at a CAMRA Victoria meeting. All systems are go for CAMRA Victoria’s Microbrewery Festival on October 23 at the Victoria Conference Centre. Gerry Hieter and John Rowling are assembling a keen team of volunteers who are already at work planning the details of the festival. Publicity and communications are being looked after by a sub-committee comprising Lou Garraway, Phil Atkinson, Dave Preston, and George Baker. Finances are the bailiwick of Dale Reynolds, and Darlene Ross is coordinating the entertainment with members of UVic’s music education department. If you wish to have a booth at the festival, or are interested in volunteering, please contact Brian Wigen. Approval has been received from the City of Victoria and the festival is set to go. Gerry Hieter and John Rowling are co-chairing the festival. Gerry is perhaps best known as the founding president of Whistler Brewing Company. He has enjoyed homebrewing ales and lagers for the past ten years…John has been a beer enthusiast since 1953. Feb 1993: a contest is announced to find a brand for the new event! Gerry recalls netting few entries. Gerry: After the 1992 festival, John and I were having beers at the old Fogg and Suds, and John suggested we open a brewery. I had only been out of Whistler Brewing for a few years, and I knew my wife would kill me if I suggested such a thing after what we had been through. I said to John, “Let’s start a beer festival”. He liked the idea and the rest is history. I don’t know if that story is printed anywhere but that’s what happened. John: My wife Carol would have killed me too! Gerry was working as the Island sales rep for Shaftebury, and I had been on a couple of sales trips with him. I watched how he would give a consumer a sample, and they would, to their surprise, actually like it. I admired his technique [as a craft beer evangelist]. We were selfish in that we wanted to go into any bar and find a beer from a “microbrewery”, which you could not do very often in 1992. So, we decided that we would not allow any of the “factory breweries” into the festival. The idea was that people would buy tickets to a beer festival, come in, and finding none of the old familiar favourites, would try these strange micro beers and get hooked. John suggested we open a brewery. I knew my wife would kill me if I suggested such a thing. I said, ”Let’s start a beer festival”. He liked the idea and the rest is history. As noted in a 1993 issue of What’s Brewing, you had some festival experience. Would you say it prepared you for the experience of creating a major new festival from scratch? 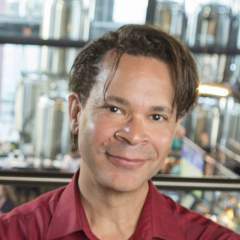 Gerry: At that time, I had been to the Great American Beer Festival (Denver, est. 1982) and the Oregon Brewer’s Festival (Portland, est. 1988), which both had good and bad things about them. We sort of took the best elements from both of these festivals and others (eg, CAMRA UK’s Great British Beer Festival, est. 1977) and created our own version. John: We also went to the Northwest Invitational Beer Festival in Seattle in September 1992 and saw that they gave each brewery an individual booth. Brilliant! Customers could talk to brewery staff about the beer, buy shirts from their favourite brewery, and other stuff. You canvassed people you knew not only in BC but in WA, OR and AB. Can you recall the tension and pressure involved in the lead-up to the event? Gerry: After we decided to go ahead, John was brilliant. He and Carol allowed us to use his home, his phone, and everything else he had. We got the media behind us and were able to get the word out early. All the local breweries cooperated with us to get tickets sold, etc. I don’t recall too much pressure at that point as we weren’t sure what to expect anyway. John: We hustled and went to a lot of meetings: Victoria AM, etc. We were trying hard to raise some money and find a suitable location. Gerry spent hours looking at halls, etc. Then we ran into Lou Garraway, the sales manager at the Harbour Towers Hotel. Lou told us that the Victoria hotel business badly needed a “shoulder season” [non-summer tourism] event, so we chose October 23rd 1993. Lou also happened to be Chairman of the Victoria Athletic Association, who had a fund for supporting worthy causes. Lou reckoned that since athletes drink beer, we could get a loan from the VAA of $5000. The deal was that we paid back the VAA first out of revenues. The next $2000 of revenues would be split 50/50 and the rest was ours. So, Lou took a risk, but in the end the VAA earned $1000 on a six month loan! Phil: As government employees, we were fortunate to be able to use “taxpayer-funded” administrative resources such as photocopying at work. Being in Victoria could be handy. One of the committee members was friendly with political connections who ultimately included the US Consul. For years, we took advantage of their diplomatic immunity to get US beer brought into the country without the standard red tape. 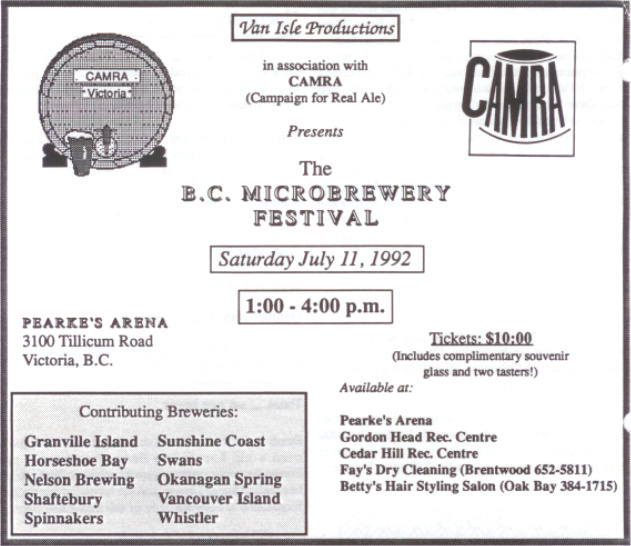 At some point in the early days circa 1994, it was recognized that the new Festival would need to be broken out from other CAMRA Victoria business and have its own Board. The group registered officially with a name that reflected a great new brand: the “Great Canadian Beer Festival Society”. Over the years, it was led by John, Gerry, and Dave Preston (who also did stints as CAMRA Victoria President and What’s Brewing editor). Dave, John, Gerry and Phil became a quartet that met somewhat regularly during planning season and oversaw the business of the Festival at a high level. Here’s what people were saying at the time. The 1993 Victoria Microbrewery Festival was an outstanding success and every CAMRA Vlctoria member should be proud that this society put on such a well-organised fun event. That’s the message we’ve been getting from participants, exhibitors, volunteers and the media. Finally, your first Festival arrived. What stuck out about the big day? Gerry: I can’t remember anything from that day as it was all running around putting out fires. John: We were so wound up it was all a blur. We had to rent a TV as we found out that the final game of the Blue Jays/Phillies World series was due to start at 6 pm. That TV didn’t stop the exodus at game time. There was a little money left over for the next festival. With this money, we finished up renting the Victoria Conference Center again for 1994. All looked good financially until we realized we needed a $1500 cash float. Carol and I had to cash a term deposit to get the money. Phil: One of the great things about the Festival was the Volunteer Afterparty. Once the workers realized that the after-shift reward would involve a feast, great beer, music and dancing, we never wanted for volunteers at all. As you will see on the [new] logo, the 1994 Festival is called the Great Canadian Beer Festival. Other “Great” beer festivals, e.g., British, American etc., use the term to mean large, huge, immense, vast, enormous, gigantic, grand… Last year’s Festival was so much fun, it was just “Great’: what more can we say? We had a great time, so we are naming the Festival that way! How did you know you needed a better name for the Fest? Gerry: We knew we needed a better name but it was the Brits in our group who wanted to call it the GCBF – a name I was never totally comfortable with even though the name helped us gain international recognition. It was good to get rid of the term “microbrewery” because it was eventually replaced with “craft”, which will itself become irrelevant someday soon. [It’s] the worst-kept secret of 2002: moving the Great Canadian Beer Festival to an outside venue. Ruminations regarding a move outside began long ago—maybe even on Day One. The reasons we’ve stayed put till now are manifold: beautiful venue right downtown in Victoria, easy access, abundant buses and taxis—why fix something that ain’t broke? Well, the main reason is that we’ve always felt a bit bad about turning people away, and ever since we started, the demand for tickets has far outstripped supply. But, you ask, “It’s a bit chilly outside in December, isn’t it?” Yes it is, so we’re also moving the date back to the weekend after Labour Day in September, and keeping fingers crossed for the balmy late summer weather that we usually enjoy in Victoria. How did people take to the idea that the tenth Fest would be in a new and strange place? What was the toughest part of planning and approvals? Gerry: It was all tough and we (I) were not prepared for the many differences in holding it outside. We basically just did things the way we had done it at the Conference Centre and we were a bit overwhelmed by the need for more security, token sellers, and so much more. The first year outside, we didn’t get the numbers we had hoped, as many people in Victoria had a wait-and-see attitude towards going outdoors. We didn’t sell many more tickets that year but our costs went up dramatically. We had to regroup and consequently moved our office to my home and made some more cuts to our budget to stay alive. They were good and bad times for us. John: I agree, we had no problem covering our costs at the Conference Centre and were very surprised when we began planning to be at Royal Athletic Park. That was the year that we handed over to Gerry, and it was kind of a baptism by fire for him. Over the years I have been constantly amazed at the ingenious solutions that Gerry has come up with for the logistical problems for the GCBF (many of these bureaucratically generated). His other strength has been his ability to pick good people for key positions. Incidentally, we would be totally remiss if we did not acknowledge the huge support we have had from our volunteers. Many of them have attended nearly every year and have almost an ownership relationship with “their” festival. Well, there you have it. After all this time, the Great Canadian Beer Festival still relies on many of the same people to plan and volunteer for it each year. Aside from Gerry, John and Phil, the current Society Directors include (with the omission of Dave) essentially the same folks that have been members all along: Festival administrator Claudia McNeil, and Gerry’s wife Petra Trafford. Speaking of that: behind so many men who dedicate themselves to pursuits like these are women like Petra, Phil’s wife Darlene, Dave’s wife Lesley and John’s wife Carol, who all deserve a mention for their contributions. Just think: if it wasn’t for common sense and a healthy fear of their wives’ opinions, the founders might have tried their hands at a brewery and not created our Festival at all! GCBF is an event that every beer fan in BC should experience at least once. If you’re a former visitor who’s been away for a while, this 25th Annual beerfest is calling you. It’s time to come home to BC’s greatest beer festival.